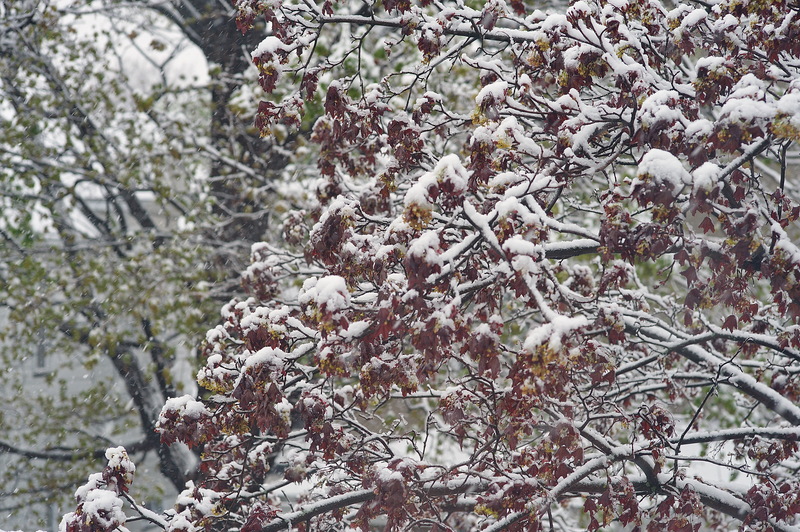 A Spring Snow Storm. The weather folk say our first major snow storm of the year. Winter recorded none. 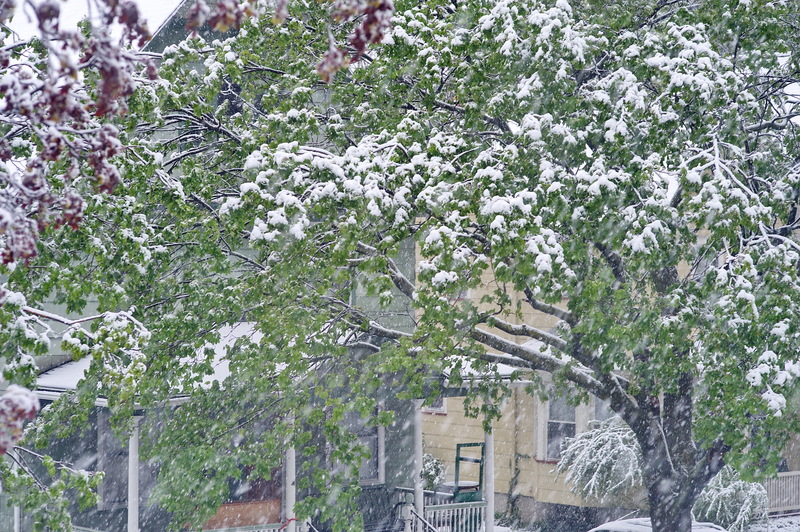 These images show the world outside my Flat here in Rochester western New York – earlier today, Monday April 23. Heavy wet snow with more predicted for the rest of today. 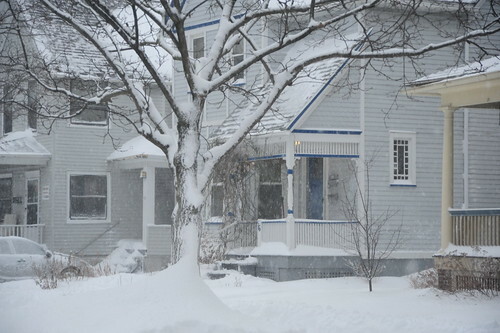 Forecast up to six inches locally with higher amounts in hills and west. Messy driving. Schools closed or with delayed openings. Downed lines with resultant power outages. This Spring our weather is a roller coaster ride. A week ago Rochester reach record high temperatures. Flowers and flowering trees abounded. See my Walk in the Park images – click here to view them. Freezing and near freezing temperatures for today and tomorrow. The temperature rises to 60 F on Wednesday. For now a few more pictures from today. 01 First Day Spring – Highland Park, originally uploaded by Adventure George. I could not help but get out. It was the first day of Spring, and one of a string of days with unseasonable warm temperatures combined with clear skies and bright sunshine. What else to do? I had to check out the early bulb plants at Rochester, New York’s, Highland Park. Not far from my flat, it is a place of great variety of flowers plants and trees. Nature starts her displays with the early growth bulb plants followed by the magnolias and other flowering bushes and trees. I make it a rule to never go to the Park without camera in hand. This time I was again glad that I did. Check out the some of the other images on my Flickr site. Click here to see them. Sunday afternoon, a time to rest and relax and take it easy and just do what I wanted. Answer no phone calls. Take no visitors. Enjoy myself. 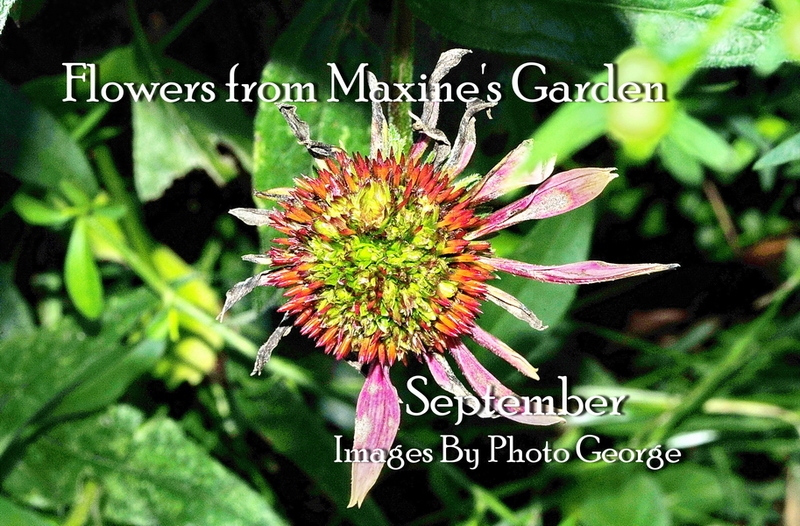 As strange as this may seem, my wish was to immerse myself in Maxine’s front yard garden. Maxine, my landlady and occupier of the first floor flat, plants flowers in the front yard in place of a lawn. It takes the entire front yard. Oh great. Now I hear flowers talk. Regardless, Sunday afternoon I was taking pictures, just as requested. Up and down the steps. In and out of the house. Try this and that shot. Plan, shoot, view. And do it all again. To shoot the images and to work with them in the computer took my full attention. It consumed me throughout the afternoon hours. At last I uploaded the finished photos to my flick account. Then I relaxed. Stress load reduced. Feeling the accomplishment. All was good. see these finished images at my Flickr site. Click here to go see them. 11 Mar 2010 – Thursday morning I boarded the Amtrak Empire Service for Penn Station, NYC transferring to a NJ Transit Express for the trip to the Hamilton Station where Lin and Rich met me. It was an easy and uneventful trip. The train was half an hour late into Albany but nearly on time into Penn Station. The track from Albany down the Hudson is good. The train, according to my Garmin GPS [map 60CSx], with which I was tracking the trip, reached a top speed, between the two, of 112 mph. The connection with the NJ Transit couldn’t have been better. I went up from track level to the expansive street level lobby. Purchasing a ticket on one of the many vending machines, I heard the final boarding call for an express train south on the Northeast Corridor. It must have brought a smile to others watching me run with my suitcase and wearing my backpack. The many two level cars were full as I joined the last-minute rush to catch the train. Thankfully I found a place to comfortably – well sort of comfortably – stand. It didn’t take longer than fifty-five minutes and soon meet up with Rich and Lin at the Hamilton station. 03 56 Boardman , originally uploaded by Adventure George. They warned us days ahead. At first it was a major storm with snow measured in feet. Then the amount of snow was reduced to was more manageable amounts. Friday, today, after a night of snow, they said the snow would change to drizzle and the temperatures rise above freezing. Today dawned with new snow near a foot. 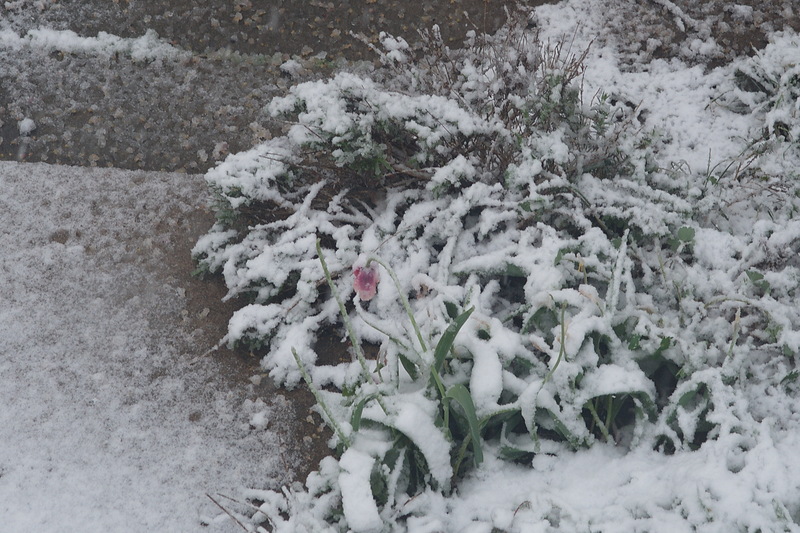 Then to the surprise of those weather predictors, the snow continued throughout the day and the temperatures remained below freezing. This morning I was out taking pictures and generally enjoying myself. Walking out the door became a mini adventure. The snow on the ground, the snow in the air quieted the noises of the City. Nothing was in sharp focus. 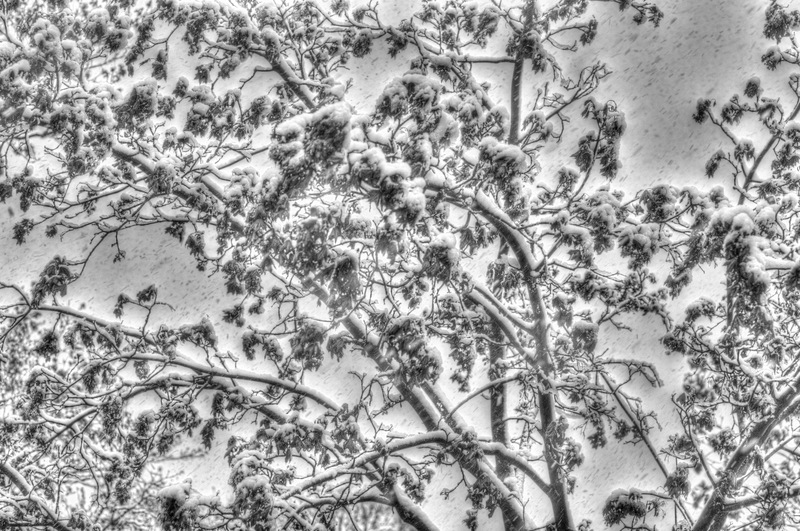 The falling snow saw to that. Walking was at best difficult on the sidewalks. The street had one plow pass something late in the night. Some were powering up their snow blowers and making a start clearing driveways. I wasn’t out long before the City’s sidewalk plows came through pushing the snow with their V blades. I waved. The driver nodded and he was past. It didn’t seem that long before he was plowing the walk on the other side of the street. For my part, I was snapping pictures documenting the morning. Then it was back inside, sitting at the computer working on the images of the morning and some from my recent time in Yosemite. I worked till four when the snow stopped and mysteriously the sky cleared long enough for the sun to shine and the waning but almost full moon visible. Yes, today’s weather presented a mini adventure and much enjoyment. The sun was bright. The blues of Irondequoit Bay Inlet and Lake Ontario beyond were soothing to the eyes. The quiet of color reached the soul producing moments of serenity. Such was the the mood during my mini-adventure to the inlet, scene of many and varied ducks during the cold winter months. Today I saw but one pair of long-tails, a couple of double crested cormorants, a lone loon, mute swans and assorted seagulls. I was glad no “had to photograph” birds were around. My camera was equipped only with my wide angle lens (Nikon 20mm 2.8D). My goal was to get experience using it. My photo backpack was at home and not in the car. This is one more thing to remember. Even if I intend to use only one lens for a photo-shoot, it is wise to have my selection of lens available should that one shot demanding a different lens appear! Though the swing bridge is now open to allow boats of all sizes to enter and leave the Bay, there were few water craft out and about. The temperature of the lake waters and the breeze blowing over it was bracing. But letting the sun bathe one in a more sheltered spot was so welcome after Rochester’s cold dark winter months. 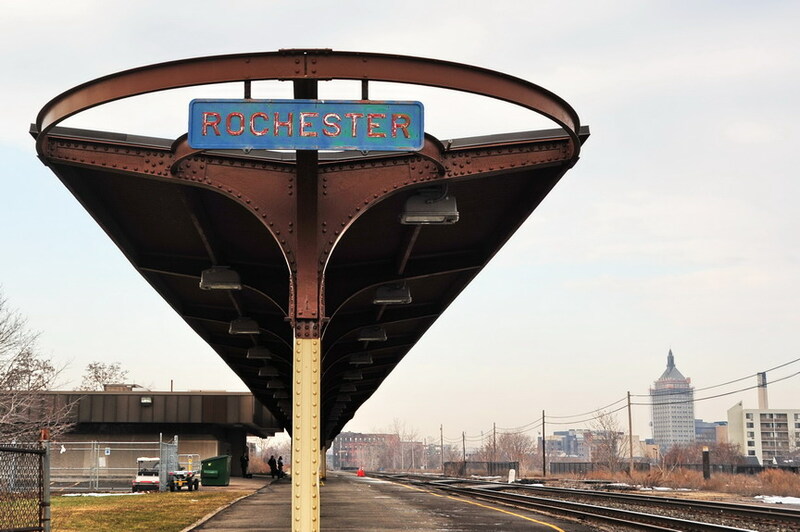 I love Rochester in the Spring!